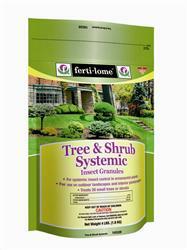 Ferti-lome Tree and Shrub Systemic Insect Granular 2.5% This product has been discontinued. See our related products. 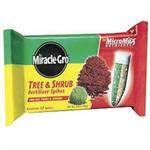 Apply Tree and Shrub Systemic Insect Granules to soil around trees and shrubs. translocates upward protecting the entire plant from insect pests. Works best prior to pest infestation. Use on Shrubs, Small Trees, Landscapes & Interior Plantscapes to control ornamental Pests such as: Adelgids, Aphids, Black Vine Weevil, Japanese Beetle, Lace Bugs, Leaf Beetles, Leafhoppers, Psyllids, Whiteflies (Ficus). 1 cup treats an 8 ft. tree. Would you like to see the Tree and Shrub Systemic Insect Granular 2.5% Label? How about the Tree and Shrub Systemic Insect Granular 2.5% MSDS sheet?